London is one of the greenest capital cities you could choose to visit. Large Royal Parks cut swathes of green through the heart of the West End. To the East the Olympic Park provides places to stroll and to take in the legacy of the games. Of course you have an option to walk along the Thames, to the East where the Thames Barrier will interest engineers, in the centre where you can visit the South Bank Centre and to the West, where riverside pubs invite on hot summer days. There are nine identified Royal Parks on their web site. Hyde Park is great location for a walk in summer. Spread between Hyde Park Corner, Marble Arch to the East and Lancaster Gate and High Street Ken to the West, the park is easily reached by public transport. You can visit the Diana Memorial, take a boat out on The Serpentine lake, visit the memorial to the 7/7 London bomb victims and on Sunday listen to people on their soap boxes at Speaker’s Corner. Kensington Gardens adjoins Hyde Park, and is probably most famous as the place that thousands of people left flowers after the death of Lady Diana. Formal gardens invite you to stroll. 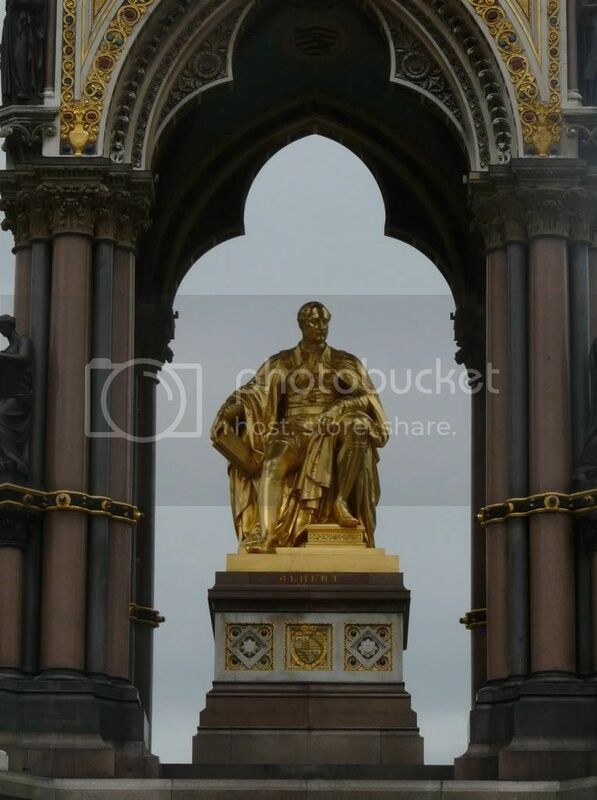 You can visit the spectacular Albert Memorial, erected by Queen Victoria in tribute to her husband after his death. Progressively opening over the next few years, after post-Olympics rebuilding, you can visit parts of the park. Getting there is easiest from Stratford station. As of 17 January 2014, this is how you can reach the park and where you can visit. The areas around the canals/rivers are especially lovely. You can combine a visit with shopping or lunch at the Westfield Centre at Stratford. A short hop from Stratford on the Docklands Light Railway is the Thames Barrier. Open to visitors Thursdays to Sundays, at £3.75 for adults it is a good value place to visit but you have to cross the river to reach the visitor centre. All the information you need is on the link above. If you are considering walking along the River Thames, you might want to check this website which covers options in some detail. One of the most popular walks is on the south side of the river where you can walk from Tower Bridge to Westminster Bridge. This takes in a number of sites mentioned in previous posts – Tate Modern, The London Eye, The Shard, The Houses of Parliament are all accessible along this route. However, worth mentioning is the Southbank Centre which contains a number of venues – theatre, galleries and concert hall are all here. Details of what is on can be found on their joint web site. Close by (near Waterloo Station) is the British Film Institute of BFI. The BFI operates the largest screen in the UK, in the centre of a traffic roundabout adjacent to Waterloo station. Check what is playing and book online if you can. If you are looking to visit somewhere a little outside London where you can understand a little more about The Thames, I would recommend Henley. Twyford Station on the main London to Bristol and South Wales lines has a direct connection to Henley Station. A few trains from London stop at Twyford you may need to first travel to Reading and then take a connecting service. For . Henley Station is located about half a mile from the town centre; a 10-20 minute walk. Henley Bridge spans the river here and there are plenty of Restaurants and Pubs to enjoy. If you don’t want to travel quite so far, you can visit Kew Bridge. Close by is the Royal Botanic Gardens at Kew. Now with an ariel walkway, the grounds and glasshouses are wonderful at any time of year. The entry is £16 for adults. So, there is plenty to do outside, much of it free, during your stay in London. I personally love walking when I visit a new place, it gives you insights in to the lives of ordinary people and sometimes you just come across something really interesting that you might never have found in your guide-book. Enjoy! The Waterlily House is now closed until April 2014. Kew Palace and the Royal Kitchens, Queen Charlotte’s Cottage are now closed until 29 March 2014. The Temperate House and the Evolution House are now closed for a major restoration project. The anticipated completion date for the project is summer 2018. Keep this in mind when/if you visit. Just came across your series. Just what I need. Going to London for the first time next month. Bookmarked! Great stuff…..have 8 free nights at the Waldorf off Weekend signup, customer service free night, and four nights of points with the 5th free……..so this report is welcome…….going for 70th D-Day reunion in Normandy so is there a specific spot you recommend in conjunction with that other than the Churchill War Rooms? Your links to Part 4 and Part 5 are your logged-in links for editing the pages rather than the public links to view the pages…. Thanks so much for the ideas……..they are all bookmarked for further research……. If I wanted to find the next heirs to Monty Python in London where might they be located? @PH – THANKS! All fixed now.